Still I do have some things to share with you my blogging friends. On Monday, June 30th, I had a huge surprise! One of the first folks that I met on Xanga was a gal named Paula (heyheyPaula), and we have become super close. We’ve been able to see each other in person four times now… the latest being when she came with her sister and BIL on a quick trek from TX through OH to Niagra Falls, on to the East coast, and then heading back down to TX again. She sent me an e-mail message from her cell phone, letting me know that they (unexpectedly) had ended up for their second rest stop at a hotel in my home town of Springfield! So … we had a lovely time together! I actually picked her up at her hotel, brought her home with me for an hour to share her with my husband & my Mom, and then took her back to her hotel. Next event that I want to share with you: Some of you may have seen this on my Facebook page, but on the evening of July 4th, my college roommate died of a cardiac arrest very unexpectedly and suddenly. Yesterday (Thursday, July 10), a friend of ours drove us to Columbus to the funeral home, and then to the church for a dinner with the family and friends, and then brought us back home. (Too much driving for me to do at this time.) I had been asked, and was privileged to share at her funeral service. The link to this is included here, if you would like to read what I shared about this very special “dynamite” friend of mine. Here is what I believe to be the last picture that we had of the two of us — maybe about 4 years ago? (I’m not sure). 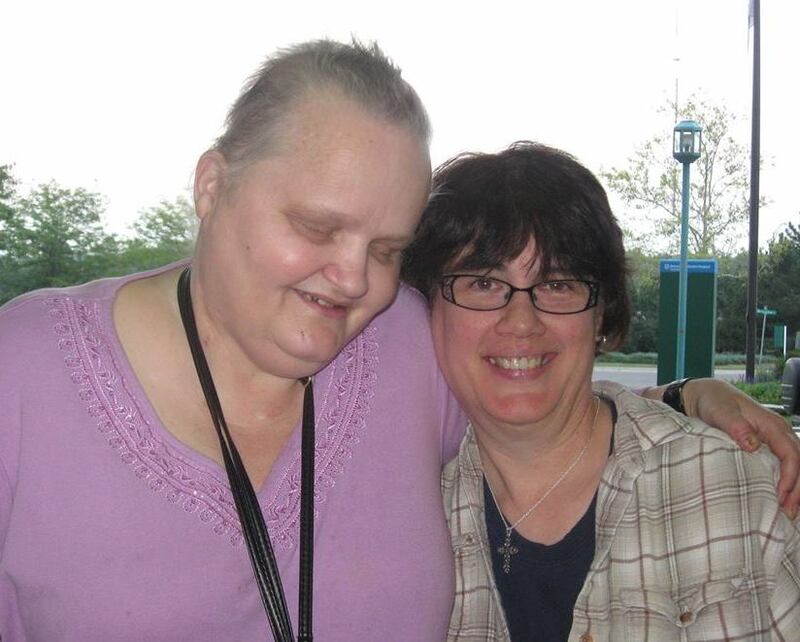 April and me – last photo together. There will be more about April in my next blog … which I’ll plan to post next week. 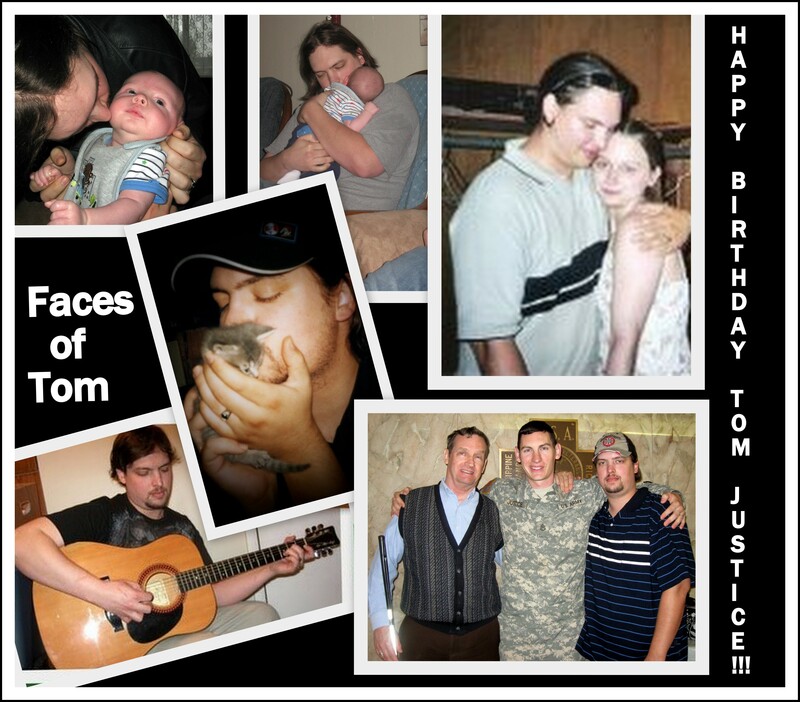 Next — July 12th is the birthday of our older son, Tom — his 36th birthday! Here is the collage that I’ve made for helping us to celebrate — a sort of card, and a wall hanging for tomorrow. I chose some pictures that gave just some of his “Faces” — he is our artistic son who enjoys music, art, photography, and more. He loves children and animals, and so enjoys loving on his nephew (pictured as a newborn) and his nieces. The top right picture goes back to when he first married his Amber. We are looking forward to celebrating with them, and with my brother, who lives near to us. More to share and celebrate in a few more days. Be seeing you over at your blog home! And since I haven’t seen my grandkids for awhile due to not being able to drive far, here are some pictures that my kind daughter-in-law posted on her FB wall. It helps to see their pictures at least! 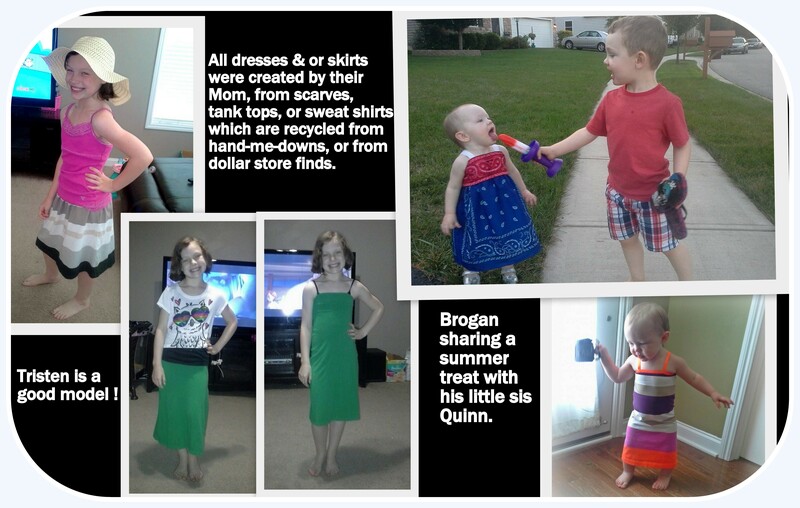 🙂 She is able to be a stay-at-home mom, and has discovered (as have we all) what a super-talented lady she is with handcrafts and creating clothing for her children… which is the theme of the last collage I am posting, followed by my encouraging thought for this post.